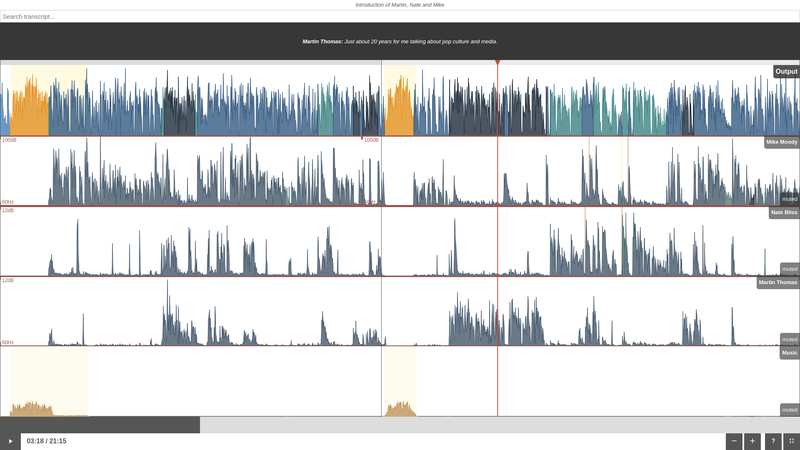 A screenshot of the Auphonic Audio Inspector on the status page of a finished Multitrack Production. Please click on the screenshot to see it in full resolution! It is possible to zoom and scroll within audio waveforms and the Audio Inspector might be used to manually check production result and input files. In this blog post, we will discuss the usage and all current visualizations of the Inspector. If you just want to try the Auphonic Audio Inspector yourself, take a look at this Multitrack Audio Inspector Example. Control bar of the Audio Inspector with scrollbar, play button, current playback position and length, button to show input audio file(s), zoom in/out, toggle legend and a button to switch to fullscreen mode. Click or tap inside the waveform to seek in files. The red playhead will show the current audio position. Use the zoom buttons ([+] and [-]), the mouse wheel or zoom gestures on touch devices to zoom in/out the audio waveform. If zoomed in, use the scrollbar or drag the audio waveform directly (with your mouse or on touch devices). Click the [?] button to show or hide the Legend, which describes details about the visualizations of the audio waveform. Use the Show Stats link to display Audio Processing Statistics of a production. Showing four input tracks and the Auphonic output of a multitrack production. Please click on the fullscreen button (bottom right) to switch to fullscreen mode. A multitrack production with output and all input tracks in fullscreen mode. Please click on the screenshot to see it in full resolution. Press [Space] to start/pause playback, use [+] to zoom in and [-] to zoom out. First, we discuss the analysis data of our Singletrack Post Production Algorithms. Singletrack Production with opened input file. See the first Leveler Audio Example to try the audio inspector yourself. Music/Speech segments are displayed directly in the audio waveform: Music segments are plotted in gold/yellow, speech segments in blue (or light/dark blue). Speech segments can be displayed in normal, dark or light blue: Dark blue means that the input signal was very quiet and contains speech, therefore the Adaptive Leveler has to use a high amplification value in this segment. In light blue regions, the input signal was very quiet as well, but our classifiers decided that the signal should not be amplified (breathing, noise, background sounds, etc.). Yellow/orange background segments display leveler fades. If the volume of an input file changes in a fast way, the Adaptive Leveler volume curve will increase/decrease very fast as well (= fade) and should be placed in speech pauses. Otherwise, if fades are too slow or during active speech, one will hear pumping speech artifacts. 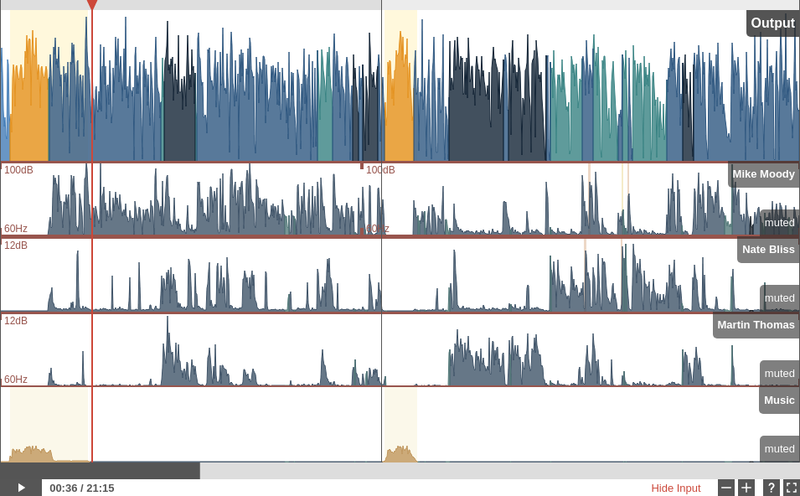 Exact fade regions are plotted as yellow (fade up, volume increase) and orange (fade down, volume decrease) background segments in the audio inspector. Horizontal red lines display noise and hum reduction profiles. 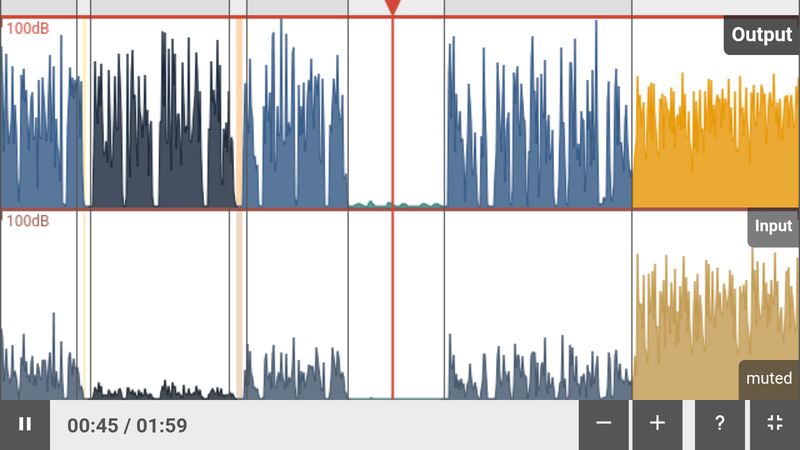 Our Noise and Hiss Reduction and Hum Reduction algorithms segment the audio file in regions with different background noise characteristics, which are displayed as red horizontal lines in the audio inspector (top lines for noise reduction, bottom lines for hum reduction). Then a noise print is extracted in each region and a classifier decides if and how much noise reduction is necessary - this is plotted as a value in dB below the top red line. The hum base frequency (50Hz or 60Hz) and the strength of all its partials is also classified in each region, the value in Hz above the bottom red line indicates the base frequency and whether hum reduction is necessary or not (no red line). You can try the singletrack audio inspector yourself with our Leveler, Noise Reduction and Hum Reduction audio examples. 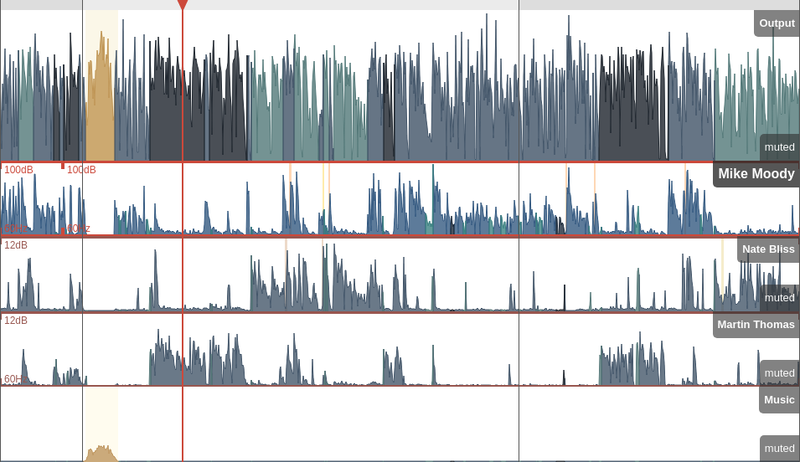 If our Multitrack Post Production Algorithms are used, additional analysis data is shown in the audio inspector. Each speaker is plotted in a separate, blue-like color - in the example above we have 3 speakers (normal, light and dark blue) and you can see directly in the waveform when and which speaker is active. Audio from music input tracks are always plotted in gold/yellow in the output waveform, please try to not mix music and speech parts in music tracks (see also Multitrack Best Practice)! You can try the multitrack audio inspector yourself with our Multitrack Audio Inspector Example or our general Multitrack Audio Examples. Music tracks can be set to Ducking, Foreground, Background or Auto - for more details please see Automatic Ducking, Foreground and Background Tracks. In Ducking, the level of a music track is reduced if one of the speakers is active, which is plotted as a dark orange background segment in the output track. Foreground music parts, where no speaker is active and the music track volume is not reduced, are displayed as light orange background segments in the output track. Here the whole music track is set to Background and won’t be amplified when speakers are inactive. Background music parts are plotted as dark organge background segments in the output track. Here the whole music track is set to Foreground and its level won’t be reduced when speakers are active. Foreground music parts are plotted as light organge background segments in the output track. You can try the ducking/background/foreground audio inspector yourself: Fore/Background/Ducking Audio Examples. If our Automatic Speech Recognition Integration is used, a time-aligned transcription text will be shown above the waveform. You can use the search field to search and seek directly in the audio file. See our Speech Recognition Audio Examples to try it yourself. Chapter Mark start times are displayed in the audio waveform as black vertical lines. The current chapter title is written above the waveform - see “This is Chapter 2” in the screenshot above. A video production with output waveform, input waveform and transcriptions in fullscreen mode. If you add a Video Format or Audiogram Output File to your production, the audio inspector will also show a separate video track in addition to the audio output and input tracks. The video playback will be synced to the audio of output and input tracks. These formats are supported in all major browsers: Firefox, Chrome, Safari, Edge, iOS Safari and Chrome for Android. FLAC is supported in Firefox, Chrome, Edge and Chrome for Android - see FLAC audio format. Only supported by Firefox, Chrome and Chrome for Android - for details please see Ogg Vorbis audio format. We suggest to use a recent Firefox or Chrome browser for best performance. Please see our blog post Audio File Formats and Bitrates for Podcasts for more details about audio formats. Multiple responsive layouts were created to optimize the screen space usage on Android and iOS devices, so that the audio inspector is fully usable on mobile devices as well: tap into the waveform to set the playhead location, scroll horizontally to scroll waveforms, scroll vertically to scroll between tracks, use zoom gestures to zoom in/out, etc. Audio inspector in horizontal fullscreen mode on Android. 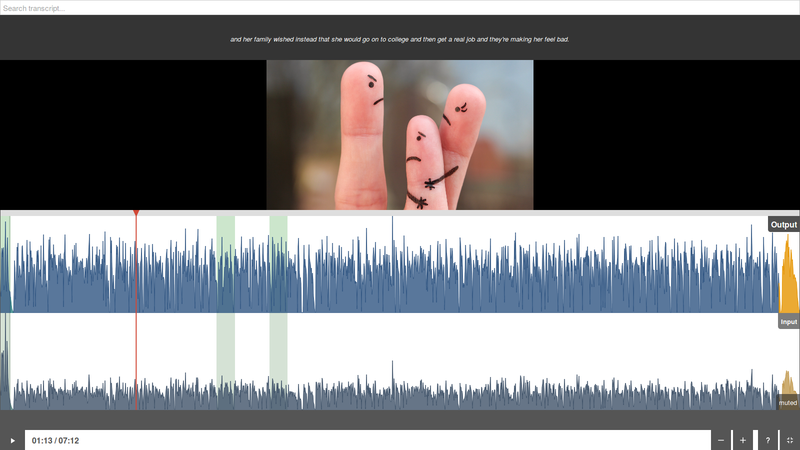 Try the Auphonic Audio Inspector yourself: take a look at our Audio Example Page or play with the Multitrack Audio Inspector Example. The Audio Inspector will be shown in all productions which are created in our Web Service. It might be used to manually check production result/input files and to send us detailed feedback about audio processing results. Please let us know if you have some feedback or questions - more visualizations will be added in future!